NEWER LISTING! ENCHANTING 2/2 Riverfront Cottage. FREE KAYAKS, BIKES & MORE! Kick off your shoes and trade them in for flip flops. Mermaids, manatees and memories are on tap when you transport yourself into the Fin & Tonic Vacation Getaway. Just like the local manatees, not all vacation retreats are alike. Here at the Fin & Tonic you will be treated to a fully renovated solid brick 2/2 home with ALL of the fun toys. Enjoy kayaking, canoeing, pedal boating, jumping off the rope swing into year round 74* water or try your hand with our stand up paddle boards (All INCLUDED). Sleep 6-7 comfortably with plenty of room to kick up your feet. 2 full baths and a large screened patio overlooking the water where you can easily dock your boat (2 Boat ramps within 5 miles) for quick Gulf access. Explore the island or head to the Rogers Park Beach on the nostalgic 4 wheel surrey bike. Fishing, seasonal scalloping, snorkeling or just kicking back, you and your family are sure to fill your days with many 1st time experiences. Relax your nights away on our huge outdoor patio enjoying some s’mores over the built in fire pit while our no-see-‘em misting system keeps the gnats and mosquitoes at bay and help you to truly enjoy River Life to its fullest. 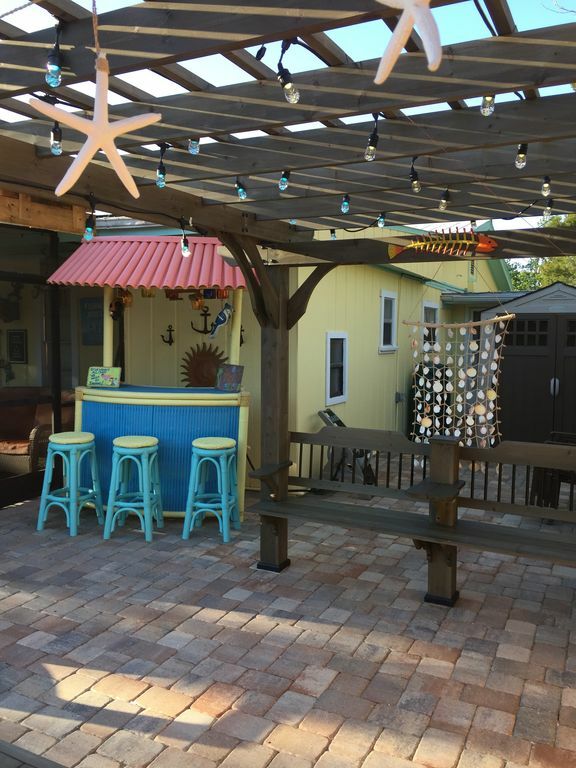 We are sure that you will be transported to “Old Florida” while exploring the crystal clear waters of the Weeki Wachee River and uncovering all of the local flair that this hidden gem of a getaway offers. Have a larger group? Inquire about our other property, 3 doors down!! www.vrbo.com/1421106. The Wet Feet Retreat. Florida transplants from Michigan and Connecticut, Tyson & Dana are avid outdoors people and passionate travelers. Married for 20+ years with 2 children. We searched all corners of Florida before settling on the Weeki Wachee area. The "Old Florida" charm and crystal clear waters immediately drew us in and never let go. Escaping here and renovating the nearly 75 year old home has been a labor of love that we have decided to share with other travelers from all corners of the world. The cottage feel and warm charm of our "little slice of heaven" keeps us coming back here every chance we get. We are sure that you will feel the same as soon as you kick off your shoes here at the Fin & Tonic Riverfront Vacation Retreat. Experience "Old Florida" in this 2/2 Enchanting cottage. Explore the crystal clear waters while searching for Manatees & Mermaids. We are sure you will fall in love with this one of a kind get away. Perfect place to stay. Great décor. Very clean. Manatee's off the dock. Could not ask for more! Thank you so much for the kind words! Glad that you enjoyed your stay. Glad that you enjoyed the River Life. Please let us know how we can get that 5th star in the future! We so enjoyed our time at Fin and Tonic, all you needed to have a wonderful vacation was waiting for you there. Clean and new, all was great. The layout of the home was done so well and the decorating was beautiful. We cooked, used the paddleboat, played games on porch and enjoyed the quiet beauty all around on the river. Thanks again. So happy that you enjoyed our "little slice of heaven". Thank you for all the kind words. We hope that you'll consider us for future vacations. This cottage was AMAZING! Beautiful decor (both inside and out), awesome patio right on the river and the amenities were fantastic! We enjoyed fishing, kayaking and paddle boarding. The beds were super comfy and there was plenty of space for everyone. (We are a family of 6, 4 of which are adults and 2 are teenagers). We can't wait to go back and be able to stay longer! Thanks so much for the kind words. We are glad that you enjoyed your stay and we look forward to your return. Great house to see the manatees! A great place to stay and see the wildlife! Manatees up stream and the eagles just to the north on the canals! A nice quiet area. Easy access to the main spring! Tanks again for a great adventure!! So glad that you enjoyed our little "Slice of Heaven"! !